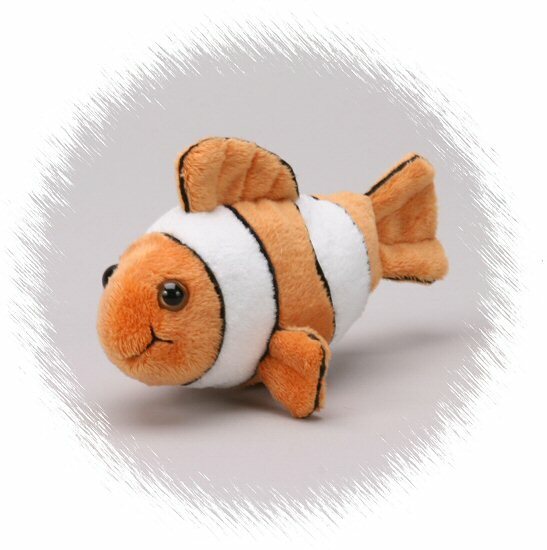 This adorable little stuffed clown fish will bring delight whether he is swimming in the ocean, in your fish tank, or having imaginative adventures in your room. You will love this Handfuls plush clown fish's soft orange and white striped body, black accents, and sweet smiling face. This little stuffed clown fish is definitely a friend for life! Joker, this Dreamy Eyes stuffed clown fish, has soft white and orange fur, fun shiny fins, and big sleepy green eyes in an oh-so-sweet face.